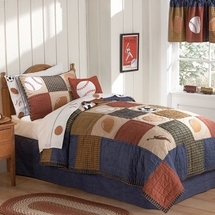 Our tremendous selection of kids quilts here at Laurens Linens, including superior quality girls quilt and boys quilt products, truly offers something for everyone! 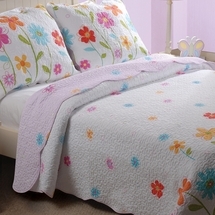 Available in twin, full, and queen bedding sizes, these great quilts for kids from today’s top kids bedding designers are offered in a wide assortment of fun and vibrant colors, styles, and patterns that your kids will absolutely love! 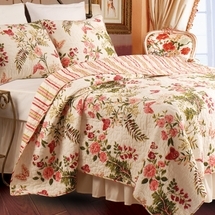 Famous brand names from top designers and manufacturers like Pemamerica, Scene Weaver, TexStyle Home Fashions, C&F Enterprises, Greenland Home Fashion and many more. Each of these beautiful kids quilt collections also features a host of other coordinating bedroom accessories and decor items including complete sheet sets, throw pillows, pillow shams, bed skirts, window treatments, and more, making it easy to create the perfect look for every kids room! (Actual items will vary from set to set). 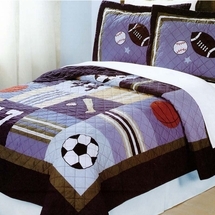 100% cotton childrens quilts for boys and girls of all ages! Machine washable and drier friendly, each of these plush kids quilts is made from only the highest quality fabric and materials, for a long-lasting comfort and durability that you can count on! 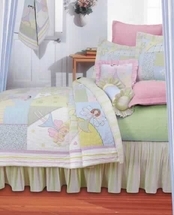 Place your order for kids quilts and much more at any time right here from our secure online store for immediate shipping directly to your home. For more info about any particular quilt for kids product offered in our current inventory, or if you prefer to order by phone, simply contact us toll-free at 877-233-2284 and a friendly Laurens Linens representative will be happy to assist you!